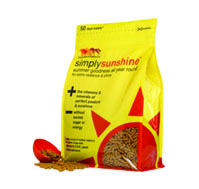 SimplySunshine contains high levels of Beta Carotene, which is then converted to Vitamin A & has antioxidant properties. Beta Carotene is plentiful in fresh grass, but deficient in hay, haylage & hard feed. SimplySunshine also contains Vitamins C & E to promote cell immunity & health; as well as Vitamin D for healthy bones & skin; one of the reasons why SimplySunshine will give your horse's coat a beautiful summer shine, all year round. Added Biotin supports healthy hoof growth; Vitamin B12 aides their metabolism & yeast probiotic encourages good gut health. SimplySunshine is suitable for all horses, but can be particularly beneficial for horses who: - Have limited access to high quality grazing - Have limited access to sunlight due to rugs or bad weather - Are stabled for extended periods of time - Are on a restricted diet - Lose condition easily SimplySunshine is even suitable for horses & ponies that are prone to laminitis. It comes in a resealable bag, to maintain freshness. Feeding Instructions: 30g daily for a horse 15g daily for a pony 1.5kg lasts a horse for 50 days, or a pony for 100 days. All Equilibrium products are Beta NOPS accredited & made in the UK.